In late January, the Polish ereader retailer Arta Tech launched a new but strikingly familiar 8" ereader. The InkBook 8 runs Android 4.2 Jelly Bean on a dual-core 1GHz CPU with 512MB RAM, and 8GB internal storage. It also has Wifi, a microSD card slot, and a headphone jack. In terms of software, the InkBook 8 ships with Arta Tech's own app store, and not Google Play. It also comes with a web browser, file manager, notepad, reading app, email client, and a dictionary. Weighing in at 258 grams, the InkBook 8 measures 8.5mm thin and packs in a 2.8Ah battery. Its 8" screen has both a frontlight and a capacitive touchscreen, and a disappointingly low screen resolution (1024 x 768). 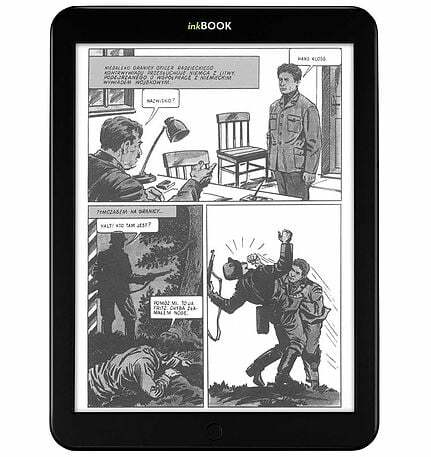 It's not a very appealing ereader, not with a retail price of 650 zloty (~ $163 USD), but when compared to the competition the InkBook 8 comes out ahead. This ereader is essentially the same hardware as the Icarus Illumina XL, which launched last October. The Illumina XL was developed by the Chinese OEM Biyue, imported by the Dutch ebook company Icarus, and can currently be had on Amazon for $229. While the hardware is the same, the devices run different software, and that is good news for you. Arta Tech has always had excellent software, and in comparison several Illumina XL owners have complained over at MobileRead forums about the software running on their ereader. They say it is laggy, and that Icarus has been unable to fix the issue. It's possible that the InkBook 8 might have the same software problems as the Illumina XL, but at least you won't have to spend so much to find out. Does Inkbook 8 support micro usb to ethernet adapter for wired connectivity ?